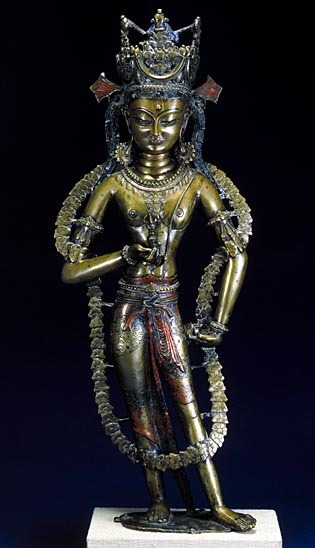 This Vajrapani (Sanskrit: “Thunderbolt-bearer”) bodhisattva, represented frontally in a standing position, is an extremely popular figure in Tantric Buddhism. His “thunderbolt-diamond” (vajra) symbol, which he is holding in his right hand, is a central feature in most Lamaist rituals. The proportions of the body, elegantly resting on the right leg, are unrealistic, with an exaggeratedly outsize bust and head in relation to the legs. The intention, perhaps, was to create an optical effect rectifying the perspective produced by the piece being probably positioned on a high altar. The strong influence of Kashmiri art is evident in the finial ornamentation of the tiara, the shape of the jewels, the ribbons attached around the hips, and the floral motif drape which leaved one knee exposed, as well as in the garlands of flowers falling half way down the legs to which they are attached by little stems. In a similar vein, the white painted eyes evoke the silver inlay works from the Kashmir region. Other details, however, such as the pronounced elongation of the body, the gesture, and some of the jewel motifs, are highly original and link this sculpture with the art of Western Tibet. This blend of foreign influences and specifically Tibetan features is typical of artistic productions from the latter country. The statue was cast using the lost wax method and is essentially composed of brass, a widely used material in Tibet.The work was probably created in the 11th or 12th centuries, at a period when this prosperous region was ruled by monarchs who maintained close artistic and religious ties with Kashmir, a major centre of Buddhist culture in the Himalaya. These rulers made protection of Lamaism one of the bulwarks of their policy.